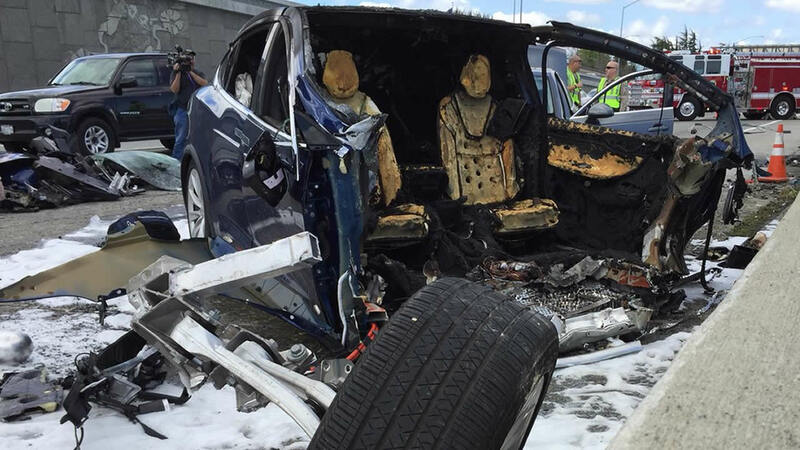 MOUNTAIN VIEW, Calif. -- A driver that died after his Tesla went up in flames Friday morning on southbound U.S. Highway 101 in Mountain View has been identified by the Santa Clara County medical examiner's office. Wei Huang, 38, of San Mateo, succumbed to his injuries Friday afternoon at Stanford University Medical Center, where he was transported after the collision, according to the California Highway Patrol. The CHP wrote on Twitter to confirm Huang's death at 3:42 p.m. Friday, approximately 40 minutes after crews had completely cleared and opened all lanes of southbound Highway 101. Huang was traveling at freeway speeds on the split along the Highway 101 and state Highway 85 junction, lost control and struck the middle barrier causing his vehicle to catch fire, according to the CHP. A Sig-Alert was issued at 9:29 a.m., the time that the CHP was notified of the crash. After Huang's Tesla hit the median, it landed in the second left-most lane of southbound Highway 101 and was hit by a white Mazda and consequently struck again by a gray Audi traveling in the adjacent lane, CHP officials said. The three vehicles were loaded onto tow trucks at about 2:20 p.m. after Tesla engineers investigated the scene and verified it was safe to move the cars, according to the CHP. For about five hours, the right two lanes of southbound Highway 101 were the only lanes open to traffic as detectives closed the carpool flyover and two left-most lanes for preliminary investigation. Mountain View fire officials responded to the scene minutes after the alert was issued since they were notified that the Tesla was ablaze. No other injuries were reported, CHP officials said.